The SVXLink node has received another update. The main reason for this update is to eliminate the use of VOX on the node. This was especially evident when going from RF to Echolink. It should no longer send “pips” and de-key over Echolink when a station on RF paused for thought. The RF link is now running on a Baofeng UV5R which is able to provide a COS signal without too much deconstruction instead of the original SMC radio. The software has also had minor changes to change the way numbers are spoken in MetarInfo reports. The new control board, made by M1LXM, has a number of LEDs to indicate the node’s current status. 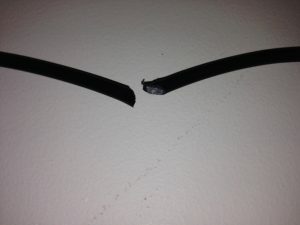 It is also more resilient to accidental disconnection as connections are now soldered instead of being on a breadboard. As always, please let us know of any feedback. GB3DT is now running an SVXLink node. This has taken over the responsibility of connecting to EchoLink from the previous computer. This has been installed by Alex (M1LXM) over the last 2 days. Information on the system and instructions on how to use it are available on the SVXLink page. 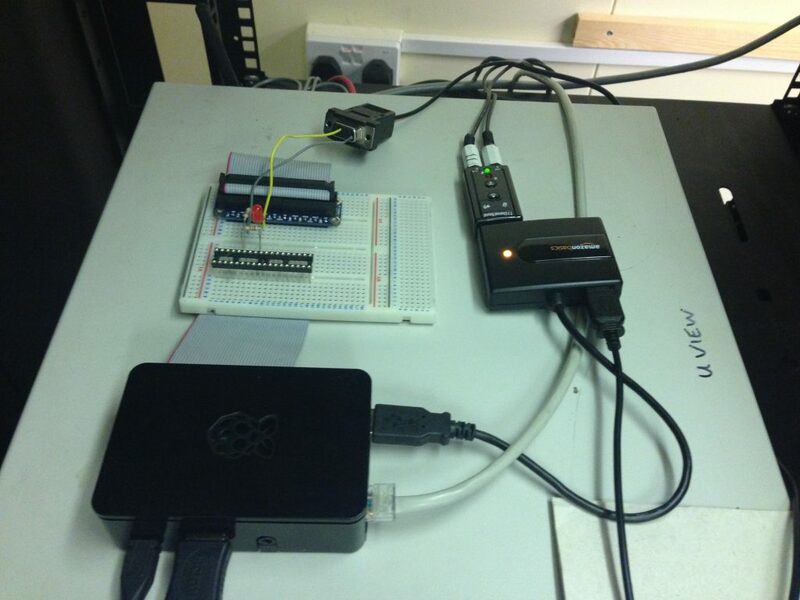 The photo below shows the Raspberry Pi connected to a USB Hub, USB Soundcard and GPIO breakout board (with TX LED!). Please let us know your comments as the system settles in! 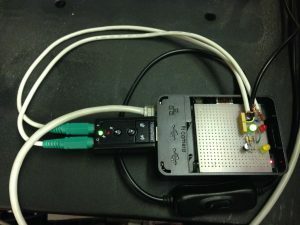 The EchoLink Node has had a few issues recently, ranging from limited internet connectivity to the computer becoming completely unresponsive. Rich (G0ZEP) has had a new internet connection installed as well as replacing the PSU for the PC and replacing the PC with a new one! Alex (M1LXM) has been working on a new system, using SVXLink, which will shortly be in place. When it is fully operational the EchoLink page will be updated as it uses different DTMF commands and has many more facilities available! It is with sadness that I have to report that Tim Hordley G8BXQ has recently become Silent Key. Tim was a founding member of GB3SP Repeater Group and was responsible for building the first repeater that would become GB3SP in 1978. I would like to share with you the eulogy that was read out at Tim’s recent funeral service. Tim was born in the spring of 1953 and brought up in Pembroke Dock, a former Royal Dockyard town on the Milford Haven Waterway, Pembrokeshire, in south west Wales. Amongst it’s proud and illustrious shipbuilding history were five of the Royal yachts and of providing the main Western seaboard defensive base during World War 2 for Sunderland aircraft. As a young boy Tim would have frequently experienced the impressive sights and immense sounds of these planes as they flew overhead and landed, often in formation, on the waterway just a short distance from his house. South Pembrokeshire is often referred to as “little England beyond Wales”. It had been occupied by the invading Normans, totally anglicised, and as a result everyone, including the Hordleys, only spoke English. Welsh was rarely, if ever, heard. Tim was the only son of Frederick, known as Danny, and his wife, Lillian. An intelligent woman, Lillian spent her adult life as a housewife and Danny was the music teacher in secondary school, although Tim never followed his dad by learning a musical instrument. Perhaps unusually, two of his closest sets of relatives including four of his cousins, lived in the same terraced street. One next door with cousins Geoff and John and the other directly opposite with cousins Peter and Pauline. They all attended the same local primary school and Tim went onto Pembroke Grammar school where he stayed until he’d completed his ‘O’ levels. Tim’s stature echoed that of his dad, and so it was no surprise that sport was never going to be one of his preferred activities! He clearly enjoyed language, featuring regularly in the prestigious glossy school magazine with poems written in his early teens. He’d also taken to photography and several times scooped the open prize in the annual Eisteddfod school competition, probably following his grandfather, a keen early photographer, who also lived in the house with the family. But he excelled in winning the Physics prize at ‘O’ level and enjoyed the practical technical opportunities that presented themselves in school. So, for example, his name always appeared in the school play credits, with responsibility for the lighting and sound equipment from an early age. It was this keen interest in practical electronics, radio and audio that probably set his future direction when he left school aged 16. This was an unusually early age in those days for an academically capable individual to head off into the great wide world. Tim gained an apprenticeship with the civilian side of the Ministry of Defence. His other older cousins had already dispersed around the country and as a result contact rapidly reduced. So unfortunately little was seen of Tim afterwards, apart from a couple of family weddings a few years later. However, he went some 60 miles north up the Cardigan coast in west Wales to RAF Aberporth. This was a small, secretive station, home to about 100 personnel and until the 1970’s involved in sophisticated missile testing using remote controlled drone targets. He later transferred as an electronics technician to the Laboratory Support Group, Technical Division, School of Signals at Blandford and remained there throughout his career, latterly as a senior electronics engineer. But Tim had always been a keen amateur radio enthusiast and a member of the Royal Signals Amateur Radio Society. This was only open to those who had served in the Royal Signals or other military units of the United Kingdom. He’s recognised by his universal radio identity GW8BXQ and is listed in the society as being heavily involved in a number of other organisations. These include the Radio Society of Great Britain; the Amateur Radio Missionary Service, and AMSAT (UK) which represents the amateur satellite community in the UK, whose members not only operate amateur satellites, but also help design, build and fund them. Martin and Barbara Shelley from west Wales, themselves keen radio enthusiasts for 50 years, knew Tim well through this common interest. They described him as a true radio ham who inspired many others into the hobby with his technical skills and unique personality. He was, they said, a real character of charm and intelligence and also, as he would probably have admitted himself, a very thrifty individual, with the knack, for example, of always managing to be the last to arrive into the bar! Interestingly, n 1978 he designed and built a very technically advanced “Repeater unit” on a former military airfield in south Pembrokeshire, one of the first UHF amateur repeater aerial systems in the UK and nationally recognised as such. Known as GB3SP it’s still going strong after 40 years and according to Martin is bringing new radio enthusiasts to the hobby, both in Pembrokeshire and further afield. Unfortunately, Martin and his wife are unable to attend as they’re currently in Germany for a large annual amateur radio exhibition featuring vintage and modern equipment. As radio amateurs they would close down conversation at the end of radio contact in their language and would wish to say bye bye to Tim; 7/3 (meaning best wishes) Tim, from Martin GW3XJQ, and 8/8 (meaning love and kisses) from Barbara MWORLD. So RIP Tim G8BXQ and now, SK. SK means silent key in Morse Code and appropriately signifies THE END of a message session. The PC running echolink has now had a total hardware failure. We are building a replacement that is likely to be ready by the end of the week. The mains power will be turned off to allow routine maintenance to be conducted on the morning of 25th May 18. The repeater will remain operational on battery power however EchoLink may be disrupted. Power in Cole Block is due to be out today until 1700 and possibly tomorrow from 0800 until 1700. There are backup power supplies in place however they may not last for the entire outage. The repeater will be unaffected however EchoLink may be affected during these periods. Rats have taken a liking to RF again at Cole Block after a few years off and left us with a clean bite through the feeder! The Echolink node has been disabled until we can get this replaced.